There have long been fears of corticosteroid side effects. The side effects that are reported can be exaggerated and not properly explained. This can lead to people not using enough of a steroid cream. 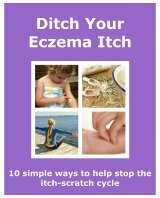 This can lead to your eczema not clearing properly and the symptoms getting worse. You may also end up having to use the treatment for longer, or you may be put on to a stronger unnecessary treatment. If a flare up isn’t dealt with properly at the start, other flare ups may occur more frequently. Corticosteroid side effects are mainly from using a strong treatment. Also if a strong treatment is used for a long period of time. Side effects from a mild treatment are unusual. It is always advised to use the weakest strength you can to treat a flare up. You may start with a stronger treatment for a short period of time. When the skin improves, you can change to a weaker one. A more potent topical corticosteroid will clear inflammation quicker, and is safe to use short term. Though it should only be used under the supervision of your doctor. Some of the milder creams can be brought over the counter at the chemist. Normally the person selling you the treatment will ask you if you have used it before. They will also tell you to not use it for longer than 7 days, and not to use it on your face. You should apply it a couple of times a day, thinly and evenly on the affected areas. You can read more about the different strengths of topical steroid creams here. How Much Topical Corticosteroid Should You Use? There are guidelines for the amount of topical corticosteroid you should use on different parts of the body. It is measured by using a Fingertip Unit, also known as FTU. A FTU is measured by using an adult's finger. You start at the tip of the finger, and go down to the first crease of the finger. There is a guide to how many FTU's are needed to treat different areas of the body. Children are normally given a milder treatment. Unless their eczema is severe or widespread. The FTU can be used to measure the treatment needed by your child. One way is to use your hand as a guide to work out the size of the area of their skin that needs treating. So for example, if the area is the size of one side of your hand and fingers, by using the above guide you can work out that you would use 0.5 FTU. There is also a rough guide to amounts that you can use. It gives the number of FTU's on different parts of the body at different ages. Remember to take into consideration that children are different sizes at different ages. Follow the guidelines, and you can reduce any chance of suffering from any of the corticosteroid side effects. If a flare up isn’t clearing or is getting worse, visit your doctor. Over the last previous years there has been less negative press about topical corticosteroids. If they are used correctly they are an invaluable part of eczema treatment for most eczema sufferers. Some people don’t like to use them and look for other ways to treat their eczema. In my experience, I have not had any side effects from using steroid creams. I use them as little as I need to. I used to take 'use sparingly' too far. My eczema would take longer to clear, so I was using the treatment for longer than I needed to. If you use your topical corticosteroids properly your skin will improve quicker, and another outbreak will occur later rather than sooner.